What Affects Your Credit Scores? Credit Score Factors Guide. When a potential landlord pulls your credit report as part of their application process or when you apply for a loan for a car or a credit card, your credit score is also provided by the credit bureau so the lender can judge your financial well-being. 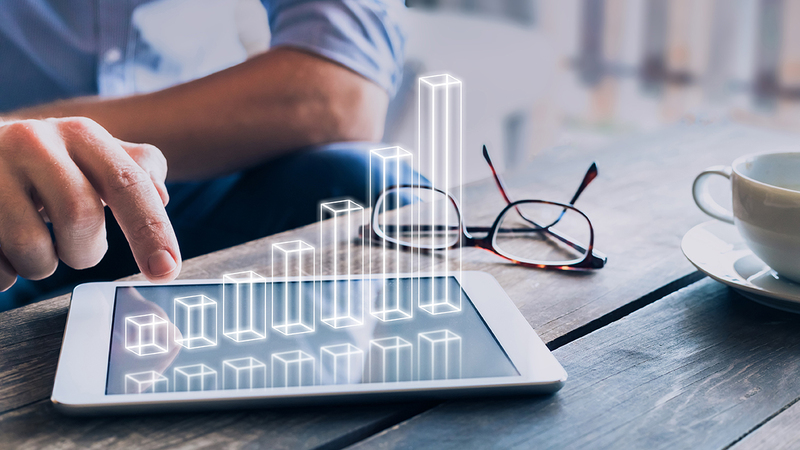 Knowing your score is the first piece of intel you need in order to make smart financial decisions, but understanding how that score is derived and what financial behavior affects your score is the key to owning your financial health. When you understand what affects your credit score, you can make better decisions to improve your credit score. The chart below demonstrates that the majority of Americans struggle with their credit. So, for many, there’s room for improvement—and understanding how the decisions you make can help or hurt your score is a step in the right direction. Source: We surveyed 1,144 US consumers in different age groups on 9/26/2018 to understand which credit score ranges they fell into. The best way to formulate a strategy to maintain or improve your credit score is to learn what’s in your credit report as well as what – and how – this information affects your credit score. Your credit report contains four pieces of information: identifying information (name, addresses, Social Security number, date of birth and employment); “tradelines” or lines of credit (car loan, mortgage, credit cards, store cards), including your credit limit and payment history; credit inquiries (which lenders have requested your credit report); and public records or collections (court records, overdue debts, bankruptcies and civil lawsuits). Related to "What Affects Your Credit Score"
Check your credit score for free with Credit Sesame to understand where you stand with TransUnion and what you can do to improve your credit based on the factors we are discussing. Explore your free credit report card from Credit Sesame to get an understand of what parts of your credit profile is impacting your credit score the most. Learn the best ways to build your credit score and what techniques you can use to maintain it. Discover the different ways that you can improve your credit score and learn about the different ways our members have used our platform for that purpose. Each of these factors is weighted in importance to produce your credit score. To start improving your credit score, you need to know what’s currently in your credit report. Americans are entitled by law to receive one copy of their credit report from each of the three credit bureaus annually. Credit Sesame members can access their score, which is updated every month, by signing up for a free account. Here are examples of financial events that can positively and negatively impact your credit score. Source: We surveyed 1,500 Americans on 2/13/2018, asking about their credit scores and negative factors affecting their credit scores, including the estimated credit score drop due to the negative factor. Does canceling a credit card affect your credit score? Closing a credit card can impact two important credit factors: your credit utilization and the average age of your credit accounts. If you’re trying to improve your credit, you might feel inclined to close a credit card after you pay off the debt —because it’s less debt, right? Actually, this would hurt your score. Your credit utilization is the ratio of the credit available to you to the credit you’re using. For example, if you have a $5,000 credit line on a credit card and you’ve charged $2,000, your credit utilization ratio is 40 percent. When you close a credit card, the credit available to you decreases, which can have a negative impact on your score. It’s better to keep the card open and maintain a balance that is lower than 30 percent of the available credit. If you don’t think you can trust yourself not to use the card after you pay it off, though, closing it won’t remove it from your credit report right away. A closed credit card will stay on your credit report for seven years. Similarly, if you’ve had the card for a long time, this can negatively impact the age of your credit, which would negatively affect your score. If you recall, most consider good credit utilization to be less than 30 percent of your available credit, which makes up 30 percent of your overall credit score. When we look at Credit Sesame members with good utilization, the average credit score is 646. However, when members increase their utilization to over 30 percent, we see the credit score decrease to 598. Source: Surveyed 500 Credit Sesame members on 2/12/2018. Americans are typically utilizing more than 30 percent of their available credit. In fact, a survey we conducted between February 15 and March 15, 2018, found that more than 56 percent have a credit utilization of 71 percent or more. Source: We surveyed 2,500 US consumers about their present credit utilization between 02/15/2018 and 03/15/2018. Remember that the age of your credit lines accounts for 15 percent of your credit score. 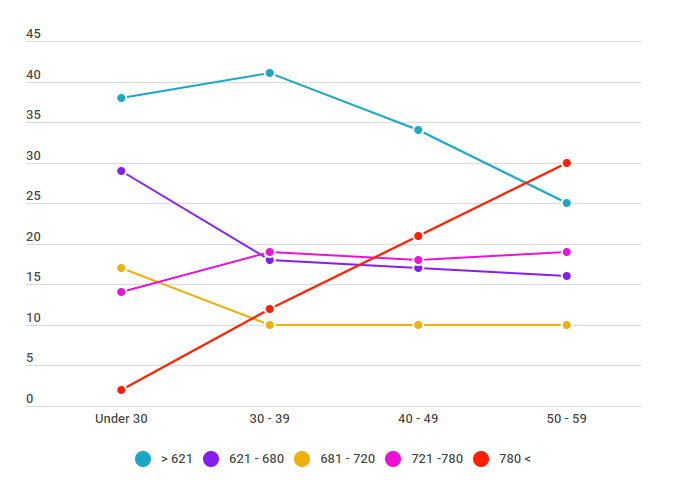 We can see from the chart below those Credit Sesame members who have an average account age of 11 years or longer have higher scores than those who have an average credit age of five to 10 years. Does checking your credit affect your credit score? There are two different types of credit pulls —a soft pull or inquiry and a hard pull. A soft pull will have no impact on your score. When you look at your own credit report, it’s considered a soft pull. An employer doing a background check is another example of a soft pull. A hard pull is when a lender requests your full credit report based on your application for credit. This is how they judge whether or not to extend you credit. Hard pulls do have an impact on your credit score, but not much. Additionally, these hard pulls stay on your report for two years but are only factored into your score for one year. The number of inquiries you have on your credit report makes up 10 percent of your credit score. We can see from the chart below that having many inquiries lowers the credit score. Source: Credit Sesame data report from 500 members sourced on 6/4/18. An exception to the inquiry impact is when you’re shopping for a mortgage, car or student loan. The credit bureaus treat multiple inquiries for the same product during a short period of time as one inquiry. Do late payments affect your credit score? The short answer is yes. Making payments late is the fastest way to tank your credit score. Late payments are weighted differently depending on how late they are. For example, a payment that is 120 days late is worse than one that is 30 days late. It can take more than a year to recover from just one missed payment. Payment history accounts for 35 percent of your score, making it the most important factor in calculating the credit score. When we look at Credit Sesame members with good payment history, the average credit score is 646. However, having a poor payment history drops the average credit score to 598. What doesn’t affect your credit score? When you take the time to understand what affects your credit score, you’re taking the first steps toward having better control over your finances. Your credit score is so much more than just a number; rather, it can be thought of as a living, breathing thing. It is constantly changing, reacting to the ever-changing information that can be found in your credit report, and it needs to be tended and taken care of. Your credit score and your credit health have a tremendous impact on your everyday life — in ways, you may not even think of. A lower credit score can cost you a significant amount of money in additional fees and interest charges — that’s a given. But a lower score can also cause you to pay higher car insurance premiums in some states, lose out on an apartment you’ve been eyeing, or even be rejected for your dream job. By understanding what affects your score, you’ll know what steps to take to monitor and improve your score. We interviewed Jill M. A 36-year-old Kindergarten teacher from Cleveland, Ohio. She is married to a fellow teacher and they have a 2-year-old daughter. Her family income is $50,000. Q: How has your score improved since you learned what affects your credit score? A: I thought my credit was good until I started looking to buy a new car. Auto loan rates were just too expensive, so I started to learn what affects my credit score and how to improve those things. 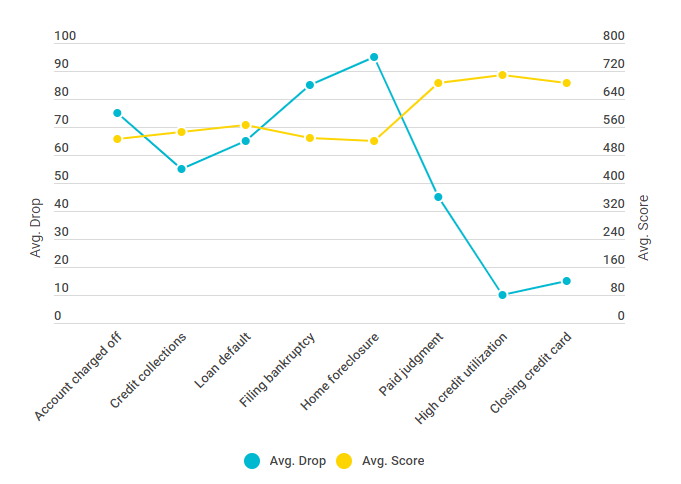 Now I monitor my credit report and work on improving the weakest areas, which has really bumped up my score. And as a result, I was able to get a much better auto loan. Q: What factor helped improve your score the most? A: The quickest fix for me was to get another credit card, because it helped improve two factors of my credit score at once. The new card increased the amount of credit available, which made my overall credit utilization drop. It also added another line of credit, which I need to help increase my score. Q: What’s the biggest benefit to learning what affects your credit score? A: Learning what affects your score is the first step to improving your score. Once I learned the factors, I worked to improve the ones that were pulling my score down the most. Whether you’re simply trying to gain a better understanding of how your credit score works or you’re interested in improving your credit, knowing what affects your credit score is your starting point. By understanding what impacts your credit score and the effects these factors have, you can better diagnose what steps to take to either maintain or improve your score—and to make smart financial decisions. Naomi is a freelance journalist who reports on personal finance and health news and how it will affect your life today. Her work has appeared on bankrate.com, getrichslowly.org, moneyrates.com, mainstreet.com, manilla.com, dealnews.com and bottomlinepublications.com among many other websites. She never writes about it if she hasn't seen it or tried it first-hand! What Credit Score Do You Start With? What is a 300 Credit Score?